Quarterback Logan Stepp’s 464 total yards and four total touchdowns led the way as visiting Otterbein spoiled the Ohio Wesleyan football team’s opener Saturday night at Selby Stadium. Stepp ran for two touchdowns, including the go-ahead score with 54 seconds left before halftime, and added two passing touchdowns in the second half to lead the Cardinals to a 36-15 win. It was the first meeting between the two schools since 1989 (a 23-12 OWU win) in a series that was once a yearly affair while both were members of the Ohio Athletic Conference. The win was Otterbein’s first against OWU since 1984 – the year after the Bishops moved to the North Coast Athletic Conference. Otterbein featured 12 area players, OWU has eight and both teams feature a Sanfillipo brother. “It’s fun and I think that’s what’ll make this game special is the fact that we’re a lot alike in a lot of ways,” Watts said. Joe Sanfillipo was second team All-OAC last season as Otterbein’s place kicker and Anthony Sanfillipo is OWU’s starting place kicker. But, it was the Stepp show Saturday night. He found Julian Lowe nine times for 147 yards. His touchdown passes in the second half put the game out of reach. 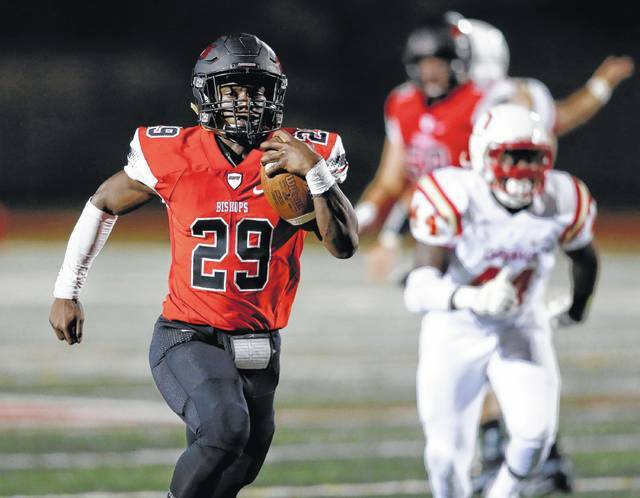 Brian Berry threw for 221 yards and a touchdown to lead OWU, but also threw four interceptions. OWU had five turnovers overall. Alex Barrett led the Bishops with 52 yards, including a 36-yard touchdown run late in the fourth quarter. Mher Tcholakian caught a 56-yard touchdown pass and finished with 71 yards receiving. Hunter Baker caught seven passes for 80 yards to lead the way in both categories. Brad Brodek led with nine solo tackles and assisted on three more and Cameron Smith forced three fumbles to lead the defense. Fred Hardgrave had two interceptions for the Cardinals and Brandon Paschal had five solo tackles and five assists to lead the defense. OWU is off next week, but returns to action Sept. 16 at 1 p.m. when it visits Wooster to open North Coast Athletic Conference play. Ohio Wesleyan’s Alex Barrett scores on a 36-yard run in the fourth quarter of Saturday’s showdown against visiting Otterbein.